In an inspiring new motivational book, management consultant and speaking guru Brian Biro describes how we can seize and act upon the Windows of Opportunity that we encounter to transform our lives. In There Are No Overachievers, renown speaker and former U.S. Swimming coach Brian Biro distills a lifetime of lessons on how to be more energized and passionate about work and life by seizing the WOO. A WOO is a Window of Opportunity--a precious, unrepeatable moment that can impact, redirect, and even reshape our lives, once we recognize and choose to seize them. By enhancing our ability to relate to others, increasing our personal energy, fostering greater teamwork, and better partnering with those around us, he shows us how we can create windows of opportunity each and every day that can change our careers and our lives. 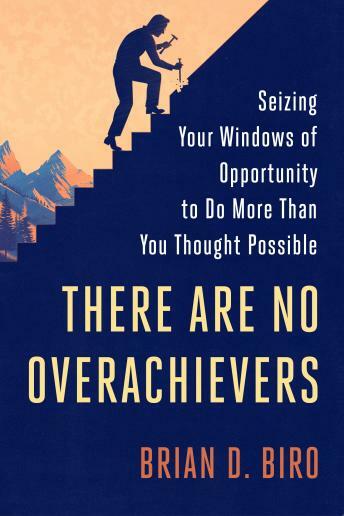 Organized in a series of short, targeted chapters, There Are No Overachievers encourages us to engage others, overcome our incessant need for approval, and go beyond our limits to deliver breakthrough results. Interweaving personal stories and anecdotes from his life as a top national swimming coach and executive vice president with insights and action steps we can apply to our lives, Biro reveals the secrets to living a rich and dynamic life, and a successful and fulfilling career.